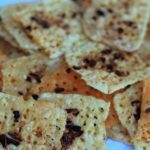 Keto Cheese Crackers are one of the first recipes most try when they embark on a low carb journey. Cutting carbs from your diet seems impossible, but with recipes like this one, it is easy and even fun to do! I know you’ll love this easy recipe just as much as my family does. 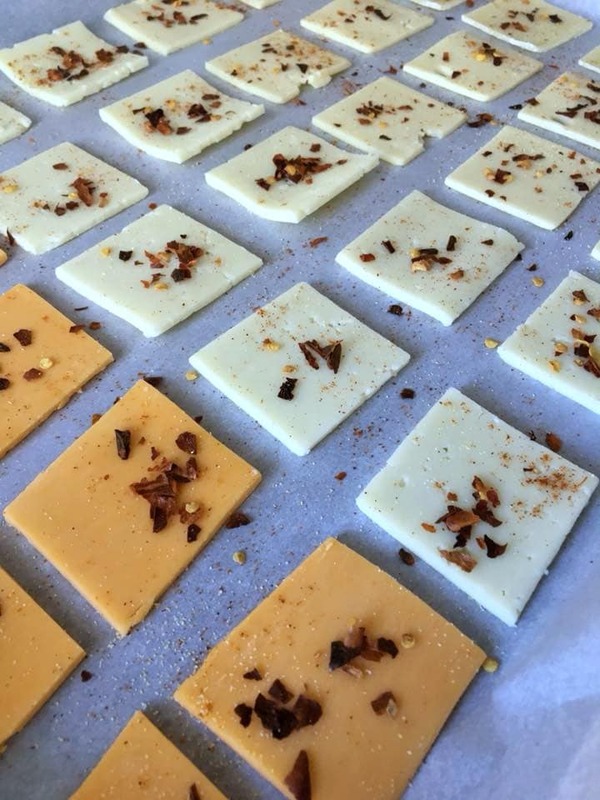 Earlier this week I posted a picture of cheese crackers I was making on Facebook in my Easy Keto/Low Carb Recipe Page. I had lots of questions so I decided that next time I made them, I would document the bake time and temperature. I also thought that although the ones I had made were good, they could be even better. So, I started experimenting. I’ve made them several times at different temperatures and baking times before finally perfecting the recipe. These have to be the most amazing and crispy ones I’ve made, and they are full of flavor thanks to extra seasoning. 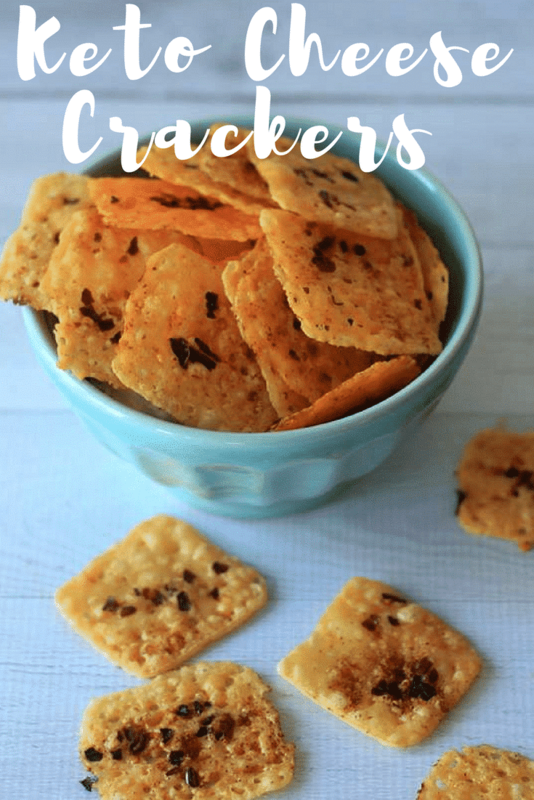 These Keto Cheese Crackers are so simple to make. The only ingredients are cheese slices and seasoning. You can’t go wrong with a recipe this easy. I’ve included all the details below. These are the cheese slices that I used. They are the perfect cracker size, and I love that all of the varieties are in one package. I bought it at Costco, but it may be available at other retailers. If you can’t find cheese slices that are already cracker sized cuts you can purchase deli slices and cut them into smaller sizes. Sprinkle the seasoning generously on all the crackers. Using parchment papers makes cleanup so easy! One of the foods that I have missed the most since we started following a keto/low carb lifestyle is Cheese-Its. I have finally found a comparable snack that takes care of my “crunchy food” cravings! These are so good! Lay cheese slices flat to fill the cookie sheet. Leave a little bit of room between each slice. If they melt together it is no big deal as once they cool they will break apart easily. I used precut slices, but you can buy larger deli slices and cut them into smaller squares. Sprinkle spices on cheese slices. Remove from oven and allow to cool for 5 minutes before eating. Once they cool you can easily break apart any cheese slices that have melted together. **Note: Baking time may vary due to variances in ovens and thickness of cheese. If the cheese isn't crunchy at 23 minutes, bake a little longer until they are. I would bake in 2-3 minute increments until I reached desired crispness. 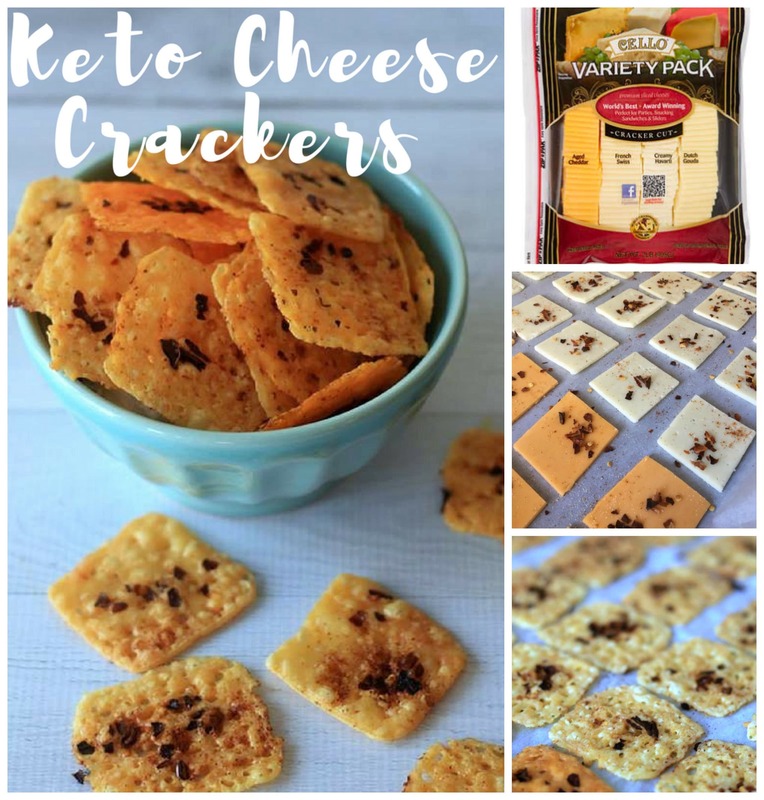 If you loved how easy and delicious these keto cheese crackers are to make, then I know you’ll love all of our keto recipes. Check out my Keto Recipe Index. 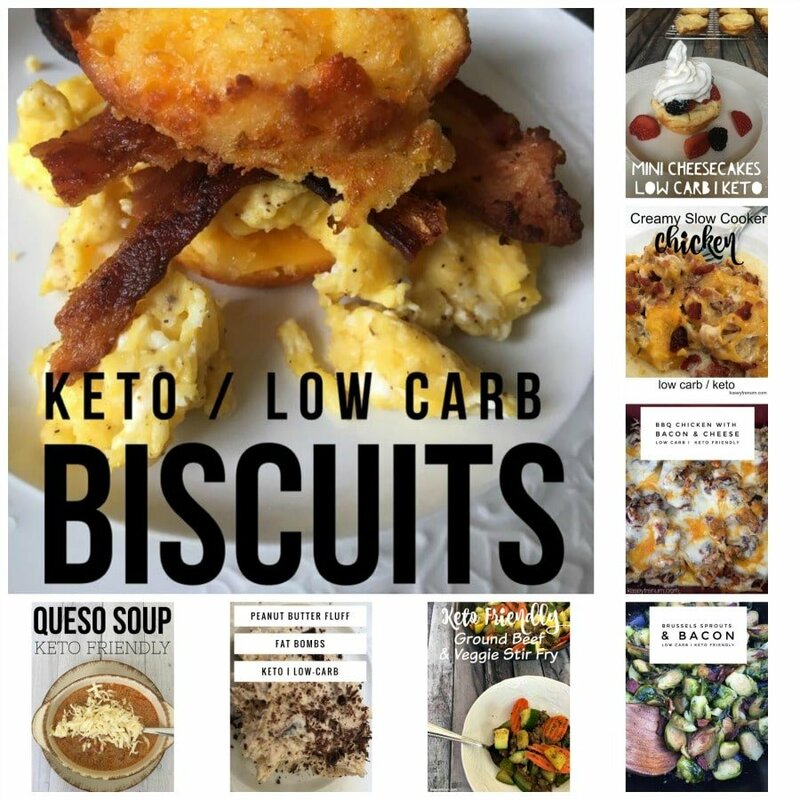 In this index, you’ll find all of our top recipes, tips, and ideas for making the keto lifestyle easy for you to manage. For more accountability, make sure you are following my Easy Keto/Low Carb Recipe Page on Facebook. You can join here and follow me on Pinterest here. Don’t forget to pin the recipe for later. Each image has a pin image you can click in the top left-hand corner. « Rubbermaid Take-a-Longs 10-Day Meal Prep Kit – PRICE DROP! hi – these look FAB! What temp/time do you suggest for high altitude? Denver, 5280. TIA! Sorry, I don’t have any suggestions as I’ve never prepared them at a high altitude. i can tell you they cook a lot faster i cooked them for 9 min less and they still have a burnt taste to them. try 10 min. Yes, mine cooked crazy fast. Which made the recipe even better!!! ? Yessss!! Less cook time means you can enjoy them faster. I live in Loveland. I had mine on the “C” oven rack at 325 degrees. I cut it 6 minutes short because they looked like they were going to burn. Not sure how to do the next batch as these tasted great but were too soft-not crisp at all. They probably needed to cook a little longer. You’ll start to see the cheese beginning to break down and little holes forming in it to make them crispy. Sure! I hope you love them. Didn’t have flakes, so I used a 1/4 tsp chilli powder. And for another set I used garlic powder and Italian seasoning. Will let you know how it turns out. 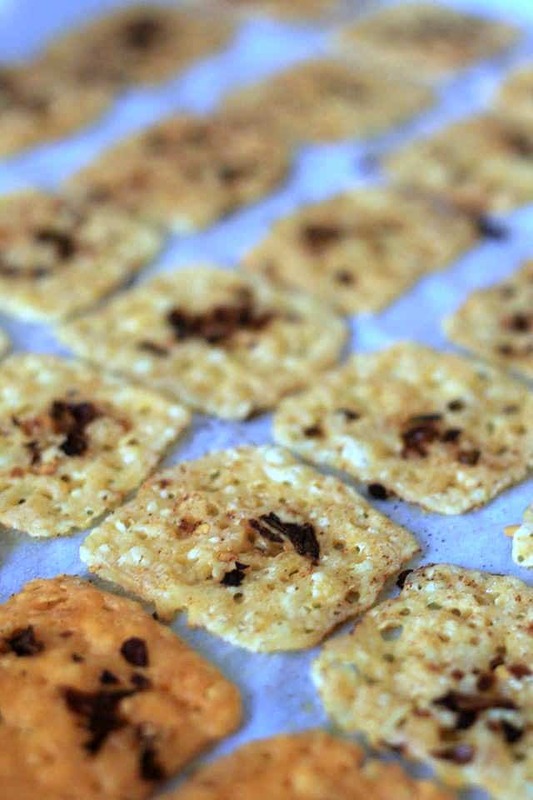 I love to make the cheese crisps also but how do you store yours so they remain crispy if they are not all eaten at the same time? I have a big family and we always eat them when I make them so I’m not sure. I store on the freezer and pop in the toast oven when I want them. I put them in a ziploc bag that i almost completely closed! Then put that bag on a plate and put them in the fridge; they were wonderful. I made homemade ranch dip with sour cream and it was sort of like chip and dip to me!!! Also, I used everything but the bagel spice on them which was awesome too!!! Roughly How many would be in a serving? That would totally depend on your personal goals and how many fit into your day. I don’t count macros I just eat until I’m satisfied so I don’t count. I came across your recipe on Pinterest and made these today and they turned out perfectly!! Thank you so much for sharing!! This is exactly what I needed! We are just getting back to a keto diet after a cross country move and it’s hard. These are going to make everybody happy. My boys will be happy to have “chips” and guac again! Wow! I hope you are able to settle in quickly. I’m so glad this recipe will be helpful. BLessings! 23 min was too long. The motzarella ones burned real bad, but when I tried them again at a shorter period of time….yum!! I have tried other keto chips & these are better. They have a kick with the spices!!! Thanks for sharing. I’ve never made it with mozzarella cheese but I could see how it might take less times. I’m glad you enjoyed them once you altered the cooking time. I think the spices really make it good. What is the macro content please? It will vary depending on what kind of cheese, size of slice, etc. so I did not include macros. The ingredients that you use can be uploaded in a keto app to determine the macros. I’d cut back on the red pepper flakes. I have problems with the cheese sticking to the wax paper. I’m using the unbleached version, not sure if this could be why. Any suggestions? I use parchment paper and they don’t stick at all. I just made these .. disaster. I followed instructions , used parchment paper and thry stuck to the paper… every single one?? What happened? That was a waste of a lot of cheese. Any suggestions?? I’ve never had anything stick to parchment paper. Are you sure you didn’t use wax paper? I love these! Today I made them with Pepper Jack – no additional spice needed! Mine did turn into circles so, not as cute as yours… I wonder if a little thicker slice might help it keep it’s shape. I’m sure all different cheese will turn out a bit differently. Sounds great, Heather. My hubby would love those. I’m so glad you enjoyed them. so they are not rubbery or chewy, they are actually crispy? I have tried cheese crisps before and they just are rubbery……used Parmesan cheese. Maybe that was the issue. If you cook them right they are very crispy and delicious. Thicker does NOT help keep it’s shape! My son tried it and we ended up with a tray of thick melted cheese! In order for cheese slices to turn into cheese crisps, they do have to melt. If you use thicker cheese you may need to spread them apart more. I don’t understand why everyone is fixated with the shape.. whether they are round or square, will your taste buds know the difference??? Sorry, just keep reading these comments. Just say thank you for the idea and move on..
Can i use normal cheese slices? (possibly kraft singles) How does the cheese harden and not melt in that temperature? I have never used Kraft singles personally but I don’t think they are real cheese so they probably would react differently. I used regular cheese slices and they melted so fast, way before 23 minutes. they never did get crisp. They taste amazing though. For my second try I doubled them so they would be thicker but they just spread out farther, still no crisp. It seems so simple, what am I doing wrong? Just found you yesterday, thank you so much for all the recipes!!! I’m not sure as I have made them so many times and each time they turned out very crispy. Are you baking them until you see holes all through them? They will almost start to brown but the holes are the key to crispiness. Would you have to store them in the refrigerator? I stored them on my counter on a plate covered in aluminum foil once and the next time I put them in a zip lock baggy and left them out. Both were fine the next day. Just made these and they were fabulous! Great way to use up some cheese. The package from Costco is huge! Yes! It is huge and exactly why I tried making these the first time. Glad you loved them. These are amazing! Just the crunch I have been missing for the past 3 months on Keto. I topped mine with some pineapple poblano guacamole and bacon pieces. Oh my, it was so delicious! Thank you for the recipe! Awesome! I was missing crunch too. Glad you loved them. I would suggest NOT using parchment or wax paper. Just a well oiled sheet pan. The cheese melted to the paper and could not be removed. Waste of cheese. Parchment paper has worked perfectly for me every single time and I’ve made these lots. Wax paper, on the other hand, creates a hot mess. Awesome! So glad you loved them. I’ll have to try sprinkling parmesan cheese on top. Great idea. Just made these for the first time and they are delicious!!! 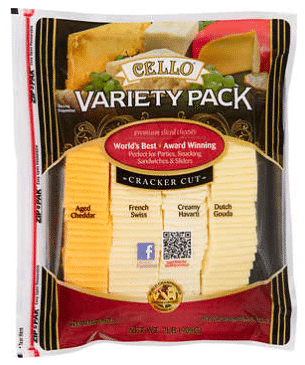 Great idea to get the variety pack of cheese from Costco – they seem to be the perfect thickness too. This first batch came out a little chewy which was actually very yummy but I’ll try to cook them longer next time so they get crispy. I was recently referred to your website and have loved the few things I’ve made. Thanks for taking the time to post them – can’t wait to try more! Awesome, Lisa! So glad you found my page. I hope you enjoy other recipes that you try is well. Thank you so much for posting this recipe! I have a Costco around the corner and I buy that same pack of cheese quite often!! I de used to use homemade everything bagel seasoning and they turned out ah-ma-zing! Thank you again! I cover them loosely on the counter if I have any left, but we usually eat them all. How long do they stay fresh leaving them on counter? I just made a big batch and am not sure if I should refrigerate any. I have them in a glass Pyrex covered with lid on counter. Not very long. I leave them on the counter in a bowl loosely covered with a paper towel. Made them and they are great. Used Tonys seasoning. The only thing is they are chewy? Any suggestions? You prob needed to cook a little longer. Also, some kinds of cheese are crunchier than others. I made these without any spices using mild cheddar and spicy pepper jack cheeses on my flat stoneware pan with no parchment paper. I did spray lightly with oil first. I cooked the first batch at 325 but they turned dark brown before the 23 minutes. I made a second batch at 320 for 18 minutes.. They also turned dark brown and had a slight burnt taste. I think the stoneware pan cooked them faster so I need to reduce the temp and the time. Yes, the stoneware pan could bake them faster. And, if you aren’t using the same cheese your cheese may be thinner as well. Awesome! So glad you enjoyed them. I used thin sliced Sorrento brand and cooked on 275 degrees. They got very crispy and delicious. Thank you. Followed exactly and mine came out perfect. Lifesaver. Yay! Glad you enjoyed them. Awesome! So glad you loved them. I just had to say thank you, thank you, THANK YOU for this fantastic, deceptively simple recipe! I’ve been eating store bought cheese crisps, which just never quite hit the spot, or were filled with carby additives. These are exactly what I wanted, and so easy to make. For data points with other people’s comments, I’ve found that jack cheese (pepper jack or colby jack) often turns dark and burnt (but I love burnt cheese so that’s not a problem!) Harder cheeses like sharp cheddar or asiago work brilliantly. I’m having a great time experimenting with different spices on top–endless flavor profile variety! Thanks again! Yay! So glad you loved them. They are a favorite around here as well. I made these twice! First batch (not this recipe) was chewy and didn’t turn out cruchy, I cooked those at 200 degrees for about 10 minutes, cause my oven usually cooks fast. But then I found your recipe and they turned out perfect. Actually I cooked a few minutes shorter than recipe calls for cause I know my oven cooks fast. These are a winner. I was wondering if you had to store in fridge cause it’s cheese? They may turn soft in the fridge huh? Oh well we’ll just have to eat them all. Thanks for posting. Awesome! I store mine on the counter loosely covered with a paper towel. Made the whole tray of cheese. Perhaps just one flavor at a time. Used parchment and no sticking. A bit chewy depending on cheese type. Some a bit more crispy. Learned not to try and fit too many on a tray. Cheddar did not spread but one of the whites did. I think it was the Harvarti. So will probably not combine 2 types on same tray. Mine all went in for 20-25 mins. Cheddar and Swiss better at 25 mins. The Harvarti better at 23 and the last one 20 mins or less actually. That one started to brown up the nicest. Spices I used…..I just sprinkled them on and mixed it up for a variety of different flavors dill, rosemary, pepper flakes and they all got onion and garlic powder. My paprika was not in supply over here. So never tried that. I just made these and I’m in heaven. I cooked them 25 minutes and topped them with Costco Pesto. Amazing. Perfect! So glad you loved them! Thank you for sharing this recipe. I’d been buying Whisps at Costco, which are just baked cheese crackers and very expensive, so I looked it up and found your page. I bought the same cheese pack and made them. They turned out crispy and delicious! I just have one question. The ones in your photos still look like nice little squares, but mine really spread out and don’t look like yours at all. Is there something you do so that they keep their shape? I don’t do anything at all. It may just be a difference in the heat of our ovens. Or, mine may be spread further apart as they do spread out some. Sometimes they spread out more than others. Thankfully, they taste delish either way. I’m so glad you enjoyed them. I just made these, and my husband said they may be the best thing I ever made. Then he quickly added, “Don’t get me wrong, you’ve made a LOT of good things”… but these are really delicious! Next I’m going to try to figure out how to adapt your recipe for the Ninja Foodi. Thanks so much for a wonderful recipe. I’m so glad he loved them!! LOL! I don’t have a Ninja Foodie yet, but I have my eye on it. O MY GOODNESS! I just made these with pepper jack and they are AMAZING!!! A bit to spicy for me but my husband will love them. I only had to bake for 15 minutes so win win for me. Thank you so much for sharing! Perfect! So glad you loved them. You must have used wax paper because nothing sticks to parchment paper. I will depend on the exact cheese you use. Oh my goodness I just made these exactly as you said and they’re amazing! Such a satisfying snack, thank you for sharing!! I only use parchment paper. I never use wax paper because everything sticks to wax paper. To blot on paper towels. These are keto friendly cheese crackers so you wouldn’t get the same consistency since there is no white fluffy gluten-filled flour. Also, cheese is greasy so that is expected. Allow to cool on paper towels and it will absorb the grease. Has anyone ever tried to make these in an air fryer? Hi, these sound great! Thanks for sharing. How do you store these and how long will they keep? I store them in a zippered storage bag. In my house, they don’t last long because everyone eats them!! LOL!! I added sesame seeeds to the seasonings. These are simple, delicious, and economical. Thank you for the recipe. Thank you Kasey! Your cheese crackers are absolutely delicious. They are easy too! Since I live in Colorado I took some of the higher altitude suggestions mentioned above and baked at 300 degrees, checking at 30 minutes. I added another 5 minutes. Crispy and spicy, I am all in. How many of the cheese slices would you say you used? Did you use the whole Costco pkg? Just use however many you want to make. I just made my first batch of these Started out at 400 degrees (by accident) then lowered the temp to 325. Kept an eye out on them. PERFECT. I did not add any seasoning and found them to be a bit salty even though they don’t have a lot of sodium in them. Still they were really crunchy. the PARCHMENT paper worked great. I spaced them so they had plenty of room to move.Great substitute for chips! Great idea using the pre-cut pieces. I will try to find cheese with less salt. Thanks! Just a follow up. I put all these different cheeses on the same pan and when they were done I could not tell them apart. They all cooked o be a light golden brown and they all looked the same. Could you use a lite sprinkle of Montreal Steak seasoning? Like everything bagels? Sure! Use whatever kinds of seasoning you prefer. How do you store these? A baggie ruined the crispness. You can’t store for long as they will lose their crispness. I put mine in a bowl on the counter and cover with a paper towel.